I like how making this post to commemorate SWTOR's launch date and taking a screenshot of my character's current look to add to the collage that I keep re-using for this purpose has become pretty much an annual tradition for me now. 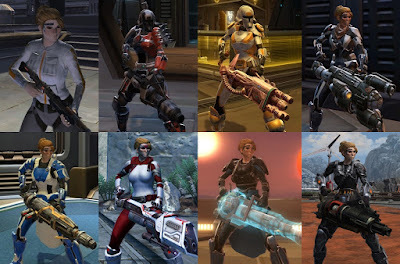 Click to marvel at my trooper's changing fashions in full size. Looking back at those previous posts, I'm noticing a slightly worrying trend: While I continue to enjoy the game and always try to maintain a positive outlook, the annual posts in review have gradually had fewer and fewer nice things to talk about. I mean, the game's launch was a disaster both in terms of PR and financial expectations, but as a player that first year was still a great time to be playing because of how much support the game received, and despite of lay-offs and other troubles, Bioware kept the ball rolling pretty well for the next couple of years after that too. Last year I noted that 2017 had been the first year in which we hadn't received a new expansion and that there had generally been fewer content releases than in any year before that, but I was hopeful that Bioware might pick up the pace again in 2018. Yet here we are at the end of December and it's been another year. In fact, it blows my mind that it's been over a year since 6.0 was first teased and not only has it not launched, we are literally not a single step closer to even knowing when it will be delivered or what it's going to contain. Now, this is not to say that 2018 has been an entirely bad year. After all, we just got a meaty patch with a new planet and some excellent storytelling in it. And there was other content before that too, such as a new flashpoint and a new warzone map. However, it all felt very... piecemeal, a very slow continuation of everything that had started last year. In fact, I keep thinking of releases such as Iokath as recent, forgetting that actually, that planet came out over one and a half years ago now (and I'm not the only one either). It just doesn't feel that long ago because not much else has happened in the meantime. Bioware has also continued the trend of prioritising big systems overhauls over tangible content additions, so we got a big Conquest revamp at the end of March and a large set of warzone changes at the start of August this year. Again, this is not a bad thing depending on where you stand on these things - for me the Conquest revamp has done veritable wonders for my engagement with the game for example - but the lack of more new content updates has still been very noticeable... to the point where we had another surge of "Is this game dead yet?" type of articles across various media at the start of the year (in response to which a fan bought the domain isswtordead.com and used it to put up his own definitive answer to the question). Last year I concluded my annual birthday post conceding that we hadn't got a lot of new content in 2017, but I was hopeful that 2018 would be better. 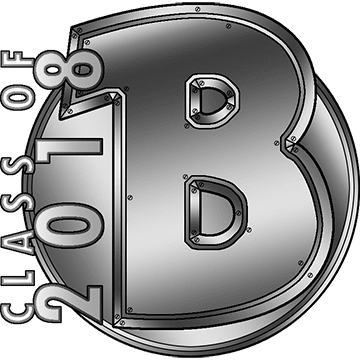 Yet here we are another year later, and to be perfectly honest, 2018 wasn't really any better; it was more of the same, which is to say that I approved of the general direction of the game but the cadence of meaningful updates has felt painfully slow. Would it be foolish to hope yet again that 2019 will bring an improvement? Whatever happens, I'll be around and looking forward to whatever updates we do get. As it stands, I still have bosses left to kill and companion returns I haven't seen, not to mention lots of stuff to do on Ossus, so I'm far from bored. Happy Birthday, SWTOR, and thanks for continuing to offer me an online home. That is a nice sequence of pictures! I was trying to do that sort of thing at intervals with the old instance group at one point. I really wish I had thought of the collage myself. Though in mine the only difference would be the background. If Ossus was not a good patch, 2018 might have been a disaster for BioWare. Looking back at the tiny pieces of content we got, I am happy Ossus came to save the day. I was so hungry for new story and content that I ate up all the bugs. Thankfully most of them did not happen to me. I was even at work when the servers came up the first time on Patch Day, so I didn't go through half the story before I had to sit down, wait 3-4 hours and start it again. What if I had just reached the Malgus scene and the servers came back down? I don't even dare to think how I would react in a moment like this. I very much liked the ending of your post. "Whatever happens, I'll be here". And yeah, the bugs are... a thing. I'm fortunate in that I'm usually able to see the humour in them instead of getting angry. But my inquisitor having to pause the Ossus story because she ran into the "dead companion comes back to life halfway through the plot" bug has been a bummer; especially as I don't immediately have another Imperial character ready to jump into another playthrough. Still, I consider myself lucky in that this occurred during my second run, not my first. I think the biggest thing that happened to SWTOR over the past year was that it didn't follow the lead of several other former AAA MMOs and either close up shop or move into maintenance mode. Given that backdrop, SWTOR's kind of meh year is positively revolutionary. I suppose you can say that. It's not been a great year for the MMO genre in general. My gut says the future of SWTOR is highly dependent on how Anthem is received, at least from a business lens. As Redbeard points, SWTOR around for 7 years itself is a tremendous achievement. I'm sure Anthem is important to the continued existence of Bioware as a separate studio, but I'm actually not sure it matters that much to SWTOR. It's just a hunch, but I got the impression that Disney wasn't too happy about that whole Battlefront lockboxes PR debacle, and it seems to me that EA is now trying to be on its best behaviour in regards to its Star Wars games in order to prove that they are still worthy of the license. And in the 8th year of Swtor, my true lives have to me...another interminable gear grind.